﻿Published by Sareth Ney on June 12, 2017 at 11:18 a.m. 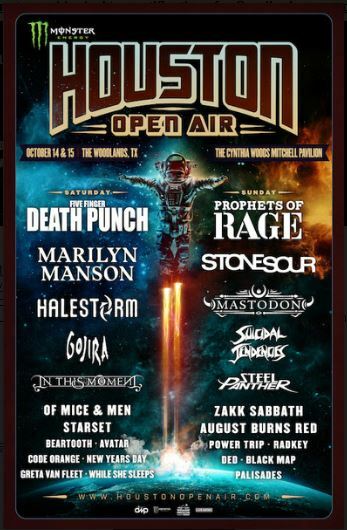 THE WOODLANDS, Texas – Five Finger Death Punch, Prophets of Rage, Stone Sour, Marilyn Manson, Mastodon and Halestorm are a few of the 25 bands which will be part of Monster Energy Houston Open Air. It will be taking place at The Cynthia Woods Mitchell Pavilion presented by Huntsman, on Oct. 14 and Oct. 15. It is produced by Danny Wimmer Presents and Live Nation. Marilyn Manson, Five Finger Death Punch, Halestorm, In This Moment, Gojira, Of Mice & Men, Beartooth, Starset, Avatar, Code Orange, New Years Day, Greta Van Fleet and While She Sleeps are scheduled to perform on Oct. 14. For Oct. 15, the lineup consists of: Prophets of Rage, Stone Sour, Mastodon, Suicidal Tendencies, Steel Panther, Zakk Sabbath, August Burns Red, Power Trip, Radkey, DED, Black Map and Palisades. Sponsors and media partners include: Monster Energy, CWMP, 94.5 The Buzz, Fxck Cancer/Dyin 2 Live and more. Tickets to attend Monster Energy Houston Open Air will be available to purchase on June 16 at 10 a.m. Central Time. They can be purchased at houstonopenair.com, livenation.com and ticketmaster.com.